Repairing the Mission Models Today was much quieter than usual, as it was the last day before half term and many went home early. While in storage, many of the mission models were either damaged or misplaced. The building team fixed anything that was broken and found anything that was missing. Meanwhile, complete mission models were placed on the board and the team began to visualise how each individual obstacle could be overcome. The models will be stored more carefully next time. 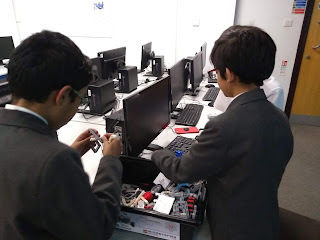 Year 7 and 8 Competition The year sevens and eights that actually turned up have been making steady progress with their robots and have begun to code them. The robots aren't finished by any means, but they're getting there. The Finishing TouchesToday, the building team was watching the mission model reveal video and using it to make the different attachments that are going to be used to complete the challenges. The coding team have started to code the robot, testing out the moving patterns on the board. they have been making small changes to the robot to have it as efficient as possible. We have also made a back-up robot, to test out other potential ideas for turning and moving. Year 7 and 8 CompetitionThe year sevens and eights have been continuing to build and design their robot, they have been experimenting different techniques for the wheels and body. They have been allowed free rein of the internet to gain inspiration for their robots. 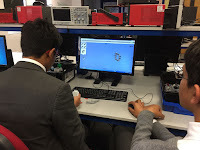 They have not yet started coding their robots as they must first build the robots to a sufficient standard to be able to complete as many of the challenges as possible.